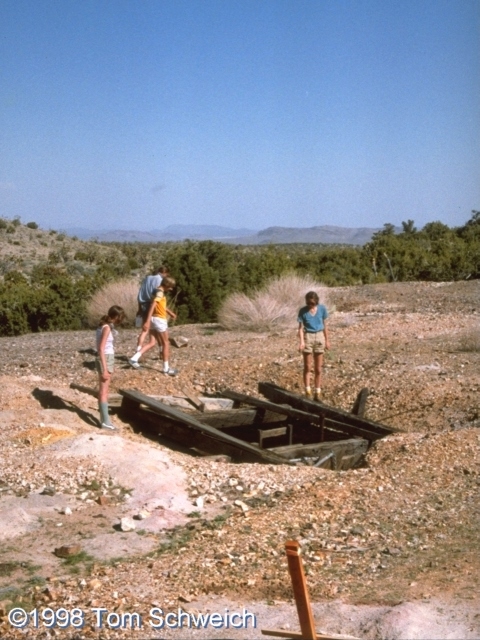 Eastern Mojave Vegetation Mine shaft. This is the shaft that Hewett (1956) notes is 250 feet deep. Kate, Scott, Matt and Linda are looking at the owl chicks in a nest about 6 feet down the shaft. The shaft is gone now as the current operators of the Golden Quail mine have dug an open pit about 30 feet deep. The stake in the right foreground marked a bore from which cores had recently been taken. None of the cores were left at the mine location. New York Mountain Road - Mojave National Preserve: at Golden Quail Mine. Eastern Mojave Geology -- A Botanist's View: Golden Quail Claims. Other photos about Economic Geology or Golden Quail Mine.